I have to laugh. When I post pictures it seems like Abishai is often in costume. Writing practice in a Texas longhorn bull shirt and cowboy vest. Abishai is left-handed, so I have to peer over his shoulder to see if he's writing correctly. Really, I should be on his right side so we don't have to cuddle so closely, but hey, why not? In our house cuddling is a favourite past time. Micaiah was playing around with the camera and this is what he took. We're laughing because my hair was tickling Abishai's face. 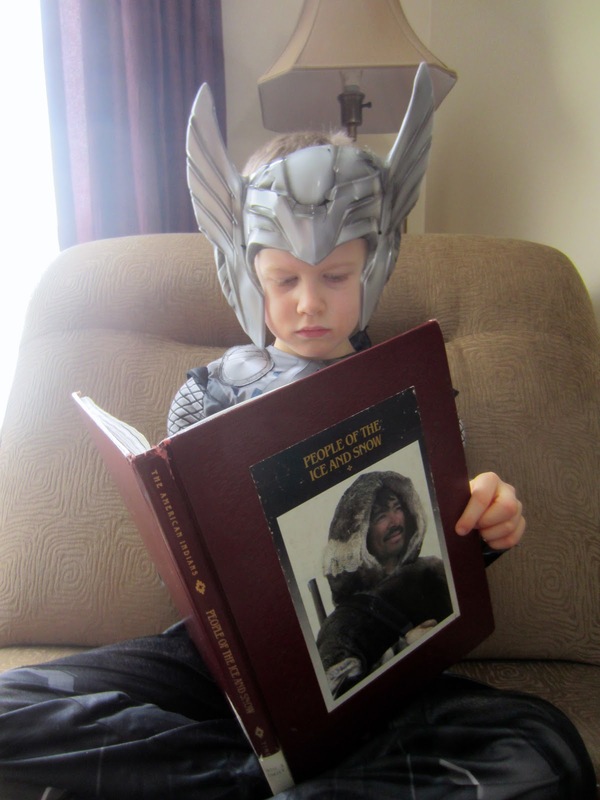 Abishai is pretending to be Thor while looking at pictures of the Inuit. I just had to chuckle when I took this picture. In an up-coming post you'll see him dressed up as an arctic seal hunter (grin). I love this boy's imagination!